in their second “serious” directorial effort after the matrix (i’m purposely not counting “speed racer”), the Wachowski’s team up with Tom Tykwer (of Run Lola Run / The International fame) to bring an ambitious high budget adaptation that still manages to be considered ‘independent’ despite the $102 million dollar budget. The trailer alone has set the tone for an ambitious, history, location and reality-spanning juggernaut. 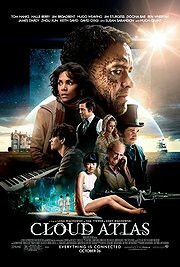 The multi-narrative style is reminiscent of things like The Fountain, Babel and Tree of Life, but it ups the ante by introducing an amazing star-studded cast and getting their money’s worth by getting them to portray a large portion of the many different characters across different epochs. But unlike the approach taken in things like Orlando, where the the same character is portrayed across time, here the same actors portray seemingly different characters, bound together only by loose narrative elements and overall ‘feel’ of their role. While not always sticking to positive or negative roles, the actors for the most part portray ‘equivalents’ of their various characters across time. Despite the apparent forced linking of plots (mostly using meaningless narrative details or just allusions), the overall connection between the stories, I found, was made through the thematic. Themes of rebellion, fight for freedom, going against the mold, and so on are prevalent throughout the film. This establishes a kind of auteur-like identity for the Wachowskis, considering the very similar themes in The Matrix and V for Vendetta. Overall very enjoyable, as it spans many genres and you could say there is something here for everybody. From the historical slavery epic, to early gay rights issues, 70’s cop movies, political intrigue to futuristic and post-apocalyptic big-brother-type scenarios, this film tries to satisfy as many genres as it can. For the most part, it does a very good job at achieving this. My only doubt is whether or not the stories could have functioned as well on their own as they did as part of the multi-narrative style, or was their worth amplified by the very mode of presentation. There is no doubt that the Wachowskis and Tykwer are masters of the cinematic language, often cutting and arranging scenes based on theme or emotion or just plain movement/action, so connection is established throughout, going beyond the mere narrative. Definitely worth watching on a big screen, but maybe a re-watch might ruin it, dispelling the magic that a first screening might invoke.